Police are upping security after two girls were allegedly threatened with beheading as they left an army reserve center in Northumbria. The girls were verbally threatened by two men in a Vauxhall Zafira, who were said to have shouted ‘graphic’ and ‘nasty’ statements as they left the center in Gateshead. “The men made no attempt to make any physical contact with the girls or get out of the car, and shouted the comments while driving away from the scene,” said Gateshead superintendent Richie Jackson. The incident took place on January 21 at 2115 GMT. 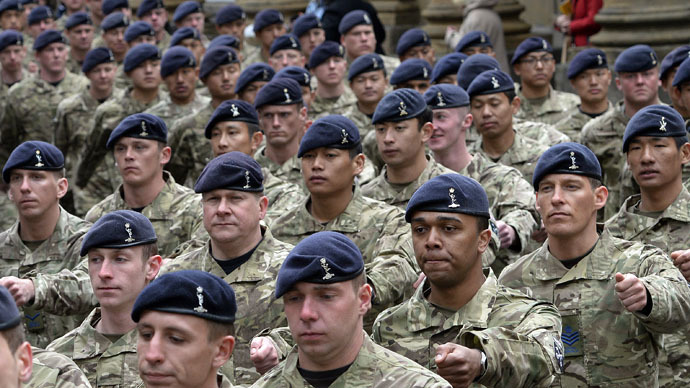 Northumbria police are thought to have increased patrols around other army barracks in the area. “Inquiries are ongoing to establish the exact nature of what was said during the incident and we have spoken to the two teenage girls, viewed CCTV footage from the area and have identified the vehicle and inquiries are ongoing to trace the driver,” a spokesperson from Northumbria Police said. The verbal attacks come weeks after British police and military officers were warned not to wear their uniforms publicly while off duty, in case lone wolf terrorists attack them. Attacks have been encouraged by Islamist extremist groups such as the Islamic State (IS, formerly ISIS/ISIL), similar to those carried out by terrorists in Paris last month. Police warn attacks on British military personnel could happen imminently, echoing the murder of Fusilier Lee Rigby in Woolwich in May 2013. “We are aware of an incident allegedly involving members of the Army Cadet Force – this is a matter for the police and we cannot comment further. Any witnesses are urged to contact the police,” said a spokesperson for the Ministry of Defence (MoD). “We understand the girls were not in uniform at the time of the incident and that the suspects asked them ‘Are you in the Army?’ before issuing the threats,” they added.